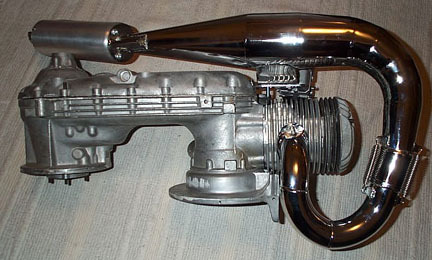 PM Tuning make a bunch of different pipes for both Vespas and Lambrettas. This one is for a TS1 barrel kit and comes either as unfinished steel or polished chrome. The one I got was chrome, but they still recommend a clear sealer over the chrome. I can't imagine that this looks as good as the chrome alone but the results will definitely wear better. I haven't decided yet if I will coat it with high temp clear. 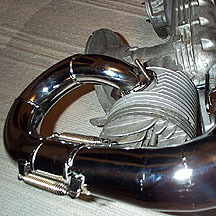 The pipe fits beautifully under the engine with only a single mount to the same location as a standard exhaust. 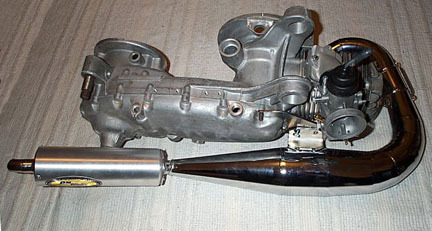 There is a rubber gasket between the engine mount and the exhaust to lessen the vibration transmission between the two. The end can is removable if it needs to be replaced or re-packed as required. The shot below and above are just rough fits of the pipe on the TS1 engine I am building so I don't know how it will fit with all the engine cooling shrouds in place. Below are a couple of detail shots of the reinforcing at the exhaust can, and the connection at the exhaust port. 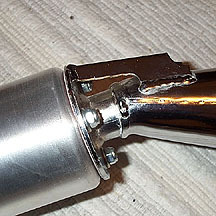 There is a slip joint with springs which allow the pipe to fit perfectly against the engine mounts. PM Tuning includes basic instructions on how to install the pipe. I will add to this page when I install my engine in the bike.